Made her debut with �KONO HIROI NOHARA IPPAI �. She has then released many hit songs including the million seller, "KINJI RARETA KOI (the forbidden love)", �NADA SOUSOU�, �SATOUKIBI BATAKE�, �ANATA GA SUKI DE�, etc. With her clear voice and talented skill, she has since become a top singer in reality and in name throughout Japan. Not only nationwide, she performed and held concerts worldwide in such places as the Carnegie Hall in New York, Los Angeles, Frankfurt Germany, Seoul Korea, USA, etc. She performed variously in TV Dramas, as a Radio Personality, etc., for 18 continuous years. Sang a theme song �ASU KOSO KODOMOTACHI GA�� at the Nagano Winter Olympics opening ceremony in 1998, and was broadcasted worldwide. Received the best singer prize, golden award, and a lyrics prize in the 44th Japan Record Award, attained 3 crowns. Released a jazz album "The Jazz Singer" in May, 2004, and held "Ryoko Moriyama US Jazz Live Tour 2004" around live houses including the famous NY Blue Note, and received a favorable review. The Official Song "MOTHER EARTH" (lyrics: Kaito Okachimachi / composition : Naotaro Moriyama) was sung at the opening ceremony of EXPO 2005 AICHI, JAPAN. Participated in The 56th �KOUHAKU UTAGASSEN (The Red and White New Year�s Singing Contest)� with her song, �SATOUKIBI BATAKE�, and it was her 3 consecutive years and 10th participation. 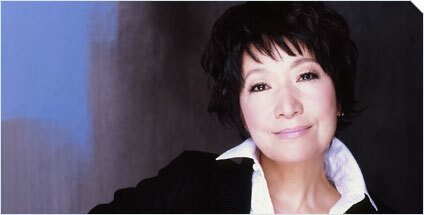 It is her 40th anniversary of debut and is currently on her national tour "the Yoshiko Moriyama concert tour 2006-2007. The album �Tears - Yoshiko Moriyama South Korean style album -" were released on March 1st and gained many support.